"I laughed so hard my sides ached and tears ran down my face!" "The show is so funny and so true!" "What a hilarious and insightful show!" "This play can save marriages... I’m not kidding!" These are just some of the comments overheard the Valentine’s weekend run of Defending the Caveman. 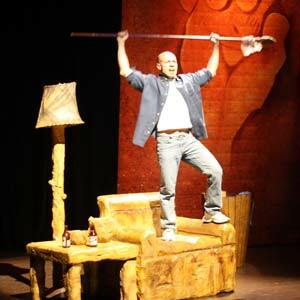 Joel Trinidad portrayed the title role of the play staged at the Insular Life Theater in Alabang. Defending the Caveman is the longest-running one-man comedy show in Broadway history, which has sold over 8 million tickets worldwide in 16 different languages. The Philippine premiere of the show, with its hilariously true insights about the differences between men and women, was greeted with uncontrollable laughter, knowing nods of agreement, and a resounding standing ovation. Defending the Caveman will return onstage on May 14 (Friday), May 15 (Saturday), and May 16 (Sunday). Performances are scheduled at 8:00 pm and will be held at the Carlos P. Romulo Auditorium, Podium 4, RCBC Plaza, Ayala Avenue cor Sen. Gil Puyat Avenue, Makati City. Joel Trinidad reprises his role as the Caveman. Michael Williams and Cathy Azanza-Dy direct. Tickets are at Php1,000 for orchestra center, Php500 for orchestra side and loge, Php300 for balcony and are available at Ticketworld. Call 891-9999. Interested parties may also text 09175378313, call 2150788, or email theatershowbusiness@gmail.com to order tickets.